The aim of following post is to share an interesting fifteenth-century image of the meeting between King Henry IV and the Byzantine emperor Manuel II Palaiologos in 1400 at London. The emperor was touring western Europe trying to solicit help for the Byzatine Empire against the Ottoman Turks and visited England for two months over the winter of 1400–01, staying with king for Christmas and being lavished by him with presents and entertainments. 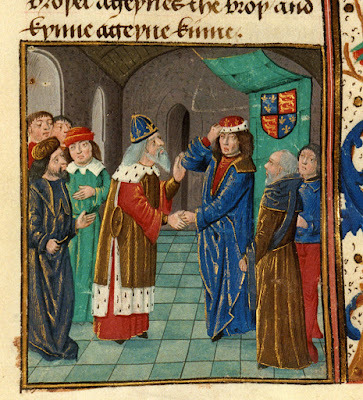 The meeting between King Henry IV of England and the Byzantine emperor Manuel II Palaiologos at London in 1400, from a late fifteenth-century manuscript of the St Alban's Chronicle (image: Lambeth Palace Library MS 6, f. 240r). The trip to England by the Byzantine, or Eastern Roman, emperor Manuel II Palaiologos in 1400 was the first such visit to these islands by a Roman emperor since Emperor Constans arrived in Britannia in AD 343, more than 1,000 years before. Emperor Manuel had been urging the rulers of western Europe to send men or money to the aid of Constantinople against the Ottoman Turks, who were close to a final conquest of the Byzantine Empire, and it was eventually decided that the emperor should travel to the west himself to put his case personally, which he did in 1400. Arriving initially in Italy and France, the emperor brought with him a large retinue of his own priests and dignitaries, alongside a collection of relics and treasures to offer as gifts to his hosts, as he sought to enlist their aide in his cause. 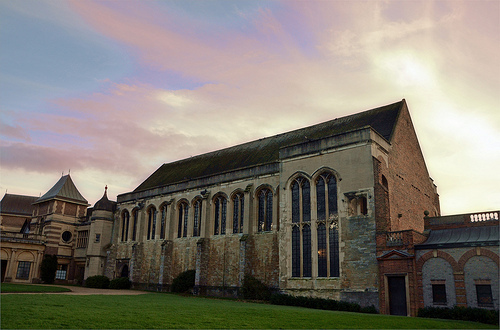 The surviving late fifteenth-century Great Hall of Eltham Palace, London (image: Dun.can/Flickr, CC BY 2.0). Now what is the reason for the present letter? A large number of letters have come to us from all over bearing excellent and wonderful promises, but most important is the ruler with whom we are now staying, the king of Britain the Great, of a second civilized world, you might say, who abounds in so many good qualities and is adorned with all sorts of virtues. His reputation earns him the admiration of people who have not met him, while for those who have once seen him, he proves brilliantly that Fame is not really a goddess, since she is unable to show the man to be as great as does actual experience. Manuel II Palaiologos finally returned to France in February 1401, with high hopes of the king providing substantial help and funds for Constantinople. On taking his leave, he was apparently showered with gifts by Henry IV and in return he presented the king with a priceless piece of the seamless tunic woven by the Virgin Mary for her son, which is said to have delighted the king—he subsequently divided the piece in two and gave one half to Westminster Abbey and other to Thomas Arundel, who gifted it to the high alter at Canterbury where it was placed in a silver-gilt reliquary alongside a thorn from the crown of thorns and a drop of Becket's blood. Unfortunately, the emperor's hopes for aid were only partially realised. 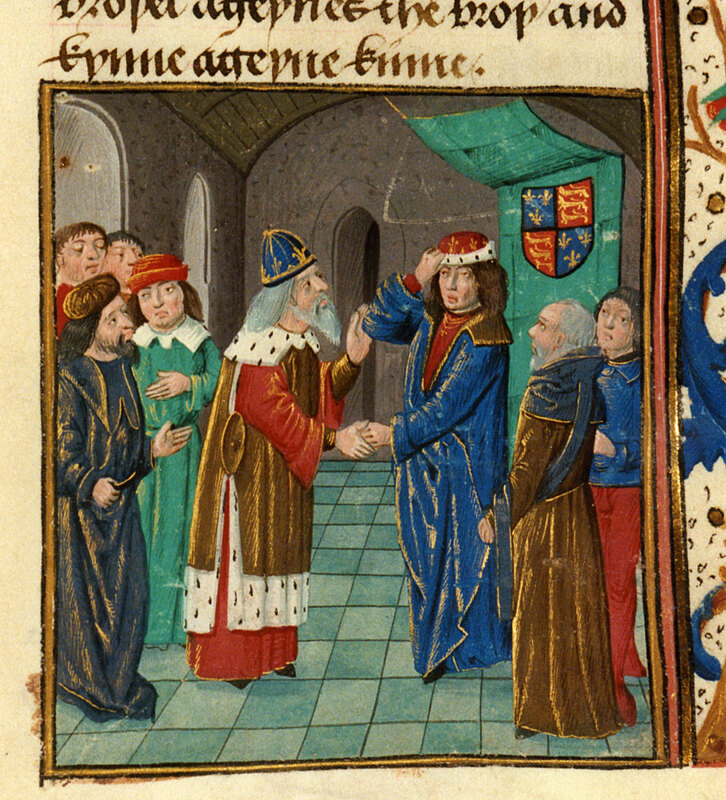 Whilst Henry provided Emperor Manuel with the huge sum of £2,000 in funds before he departed England, no military help appears to have materialised, despite a subsequent letter from the emperor's nephew in Constantinople, John VII, in June 1402 requesting official military aid and paying tribute to the English noblemen who were apparently then engaged in the defence of Constantinople in a personal capacity. 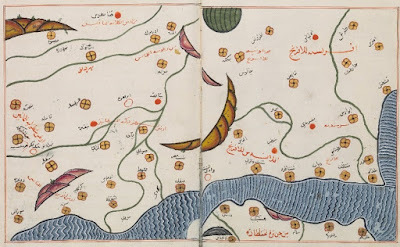 Fortunately for the Byzantine Empire, however, such aid was not in the end required—the Turkish Sultan Bayezid I was defeated and captured by the Turco-Mongol ruler Timur at the Battle of Ankara in 1402, granting Constantinople a reprieve and postponing the final fall of the Byzantine Empire for another 51 years. The sequence of buildings at St Paul in the Bail, Lincoln, showing their relationship to the Roman forum. 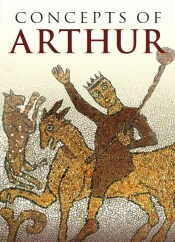 Image: Green, Britons and Anglo-Saxons, 2012, fig, 12, copyright English Heritage. 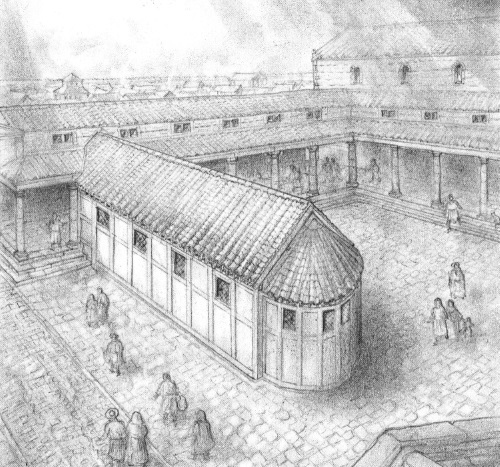 Reconstruction of the fifth- to sixth-century apsidal church at St Paul in the Bail, Lincoln, located in the centre of the Roman forum and entered from the western portico. Image: Green, Britons and Anglo-Saxons, 2012, fig. 13, by David Vale/SLHA. A sequence of fifth- to sixth-century British churches in the centre of the Roman forum at Lincoln would likewise seem to have a very good local and regional context too. First, Lincoln itself seems to have remained economically vital into the very late Roman era, with not only good evidence for continuing specialist industry, cohesive central organization, considerable population and a thriving market at Lincoln right into the very late fourth century, but also indications of both continued urban activity into the early fifth century and the operation of the Romano-British pottery industry here at least partway through the fifth century, as was discussed in a previous post. (13) Second, and most importantly, there is now a reasonably substantial body of evidence to suggest that the former Roman provincial capital at Lincoln actually retained its centrality into the post-Roman period, becoming the focus of a British polity known as *Lindēs (from British-Latin Lindenses), as has been discussed at length elsewhere. This polity would eventually become the seventh-century Anglo-Saxon kingdom of Lindissi/Lindsey (a name which derives from Late British *Lindēs), but as a British political territory it is now thought likely to have survived right through the fifth century and at least some way into the sixth. (14) Needless to say, this is a point of considerable significance in the present context. 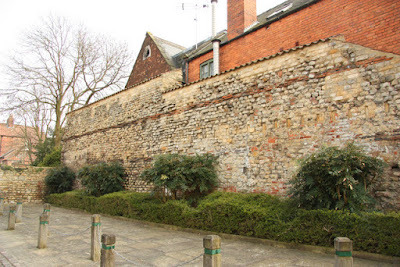 The Roman Mint Wall, Lincoln. This is the surviving portion of the basilica wall immediately to the north of the St Paul-in-the-Bail site; it originally stood nine metres high. It has been argued that the forum area must have remained open and maintained, with graves from the post-church inhumation cemetery marked, right through into the tenth century, when a small stone church was then built around what would seem to be one of the most important of the inhumation graves here (a late sixth- or seventh-century cist grave containing the only grave gift recovered from the whole cemetery, a Late Celtic hanging-bowl). In this light, one credible interpretation is that after the apsidal church was demolished, significant activity—be it ecclesiastical or secular—continued in this part of Lincoln, focused on the former large basilica that formed the north of the forum: certainly, this would explain not only the significant surviving elements of the basilica here, but also the presence of the graveyard in the forum (image © copyright Richard Croft, via Geograph, CC BY-SA 2.0). The Roman well in Lincoln's forum, located immediately to the east of the fifth- to sixth-century apsidal church and possibly used as its baptistery; the well remained in use until the seventeenth century (image © copyright Tiger, via Geograph, CC BY-SA 2.0). 1. 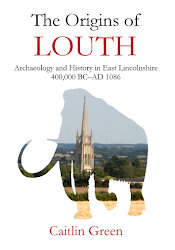 Green, Britons and Anglo-Saxons: Lincolnshire AD 400–650 (Lincoln, 2012), pp. 65–9, 82–3 (based on my PhD thesis), and Green, 'The British kingdom of Lindsey', Cambrian Medieval Celtic Studies, 56 (2008), 1–43 at pp. 18–23, supported recently by J. Hines & A. Bayliss (eds. ), Anglo-Saxon Graves and Grave Goods of the 6th and 7th Centuries AD: A Chronological Framework, Society for Medieval Archaeology Monograph 33 (London, 2013), pp. 549, 550. 2. See, for example, K. Steane, The Archaeology of the Upper City and Adjacent Suburbs (Oxford, 2006), especially p. 192; M. J. Jones, 'St Paul in the Bail, Lincoln: Britain in Europe? ', in K. Painter (ed. ), Churches Built in Ancient Times: Recent Studies in Early Christian Archaeology (London, 1994), pp. 325–47 at pp. 328–30 and fig. 5; M. J. Jones, 'The Colonia era: archaeological account', in D. Stocker (ed. ), City by the Pool (Oxford, 2003), at pp. 127–9, 137; M. J. Jones, Roman Lincoln: Conquest, Colony and Capital (Stroud, 2002), p. 127; Green, 'British kingdom of Lindsey', pp. 18–23; Green, Britons and Anglo-Saxons, pp. 65–9, 82–3; pace B. Gilmour, 'Sub-Roman or Saxon, pagan or Christian: who was buried in the early cemetery at St-Paul-in-the Bail, Lincoln? ', in L. Gilmour (ed. ), Pagans and Christians – from Antiquity to the Middle Ages (Oxford, 2007), pp. 229–56. 3. Green, Britons and Anglo-Saxons, p. 65; Steane, The Archaeology of the Upper City and Adjacent Suburbs, especially pp. 160–1; Gilmour, 'Sub-Roman or Saxon', pp. 249, 252. 4. See especially Sawyer, Anglo-Saxon Lincolnshire (Lincoln, 1998), pp. 226–30, for a championing of this theory, but beware his use of the radiocarbon data, which stretches it to the very utmost limits and beyond; this dating is also supported, far more tentatively, in A. G. Vince, 'Lincoln in the early medieval era, between the 5th and 9th centuries: the archaeological account', in D. Stocker (ed. ), The City by the Pool. 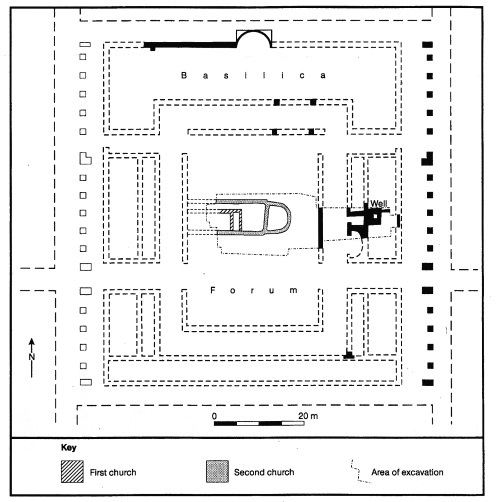 Assessing the Archaeology of the City of Lincoln (Oxford, 2003), pp. 147-151. 5. For criticisms of Sawyer's theory, see further Green, 'British kingdom of Lindsey', especially pp. 19–20 at fn. 85; Green, Britons and Anglo-Saxons, pp. 65–9, 82. It should be noted that Alan Vince acknowledges that the theory of a seventh-century origin for the apsidal church requires both a degree of special pleading and doesn't account for the first building on the site, which Vince would (somewhat bizarrely given that the alternative interpretation of the whole site) have as a late Roman or post-Roman British church: Vince, 'Lincoln in the early medieval era', pp. 149, 150–1, and see further below. 6. Green, 'British kingdom of Lindsey', pp. 19–20; Green, Britons and Anglo-Saxons, p. 65; M. J. Jones, 'St Paul in the Bail, Lincoln: Britain in Europe? ', in K. Painter (ed. ), Churches Built in Ancient Times: Recent Studies in Early Christian Archaeology (London, 1994), pp. 325–47; K. Steane, 'St Paul-in-the-Bail – a dated sequence? ', Lincoln Archaeology, 3 (1990–1), 28–31; M. J. Jones, 'The Colonia era: archaeological account', in D. Stocker (ed. ), City by the Pool (Oxford, 2003), pp. 127–9, 137; M. J. Jones, Roman Lincoln: Conquest, Colony and Capital (Stroud, 2002), pp. 127–9; B. Eagles, 'Lindsey', in S. Bassett (ed. ), The Origins of Anglo-Saxon Kingdoms (London, 1989), p. 207. 7. Sample number 34, see B. Gilmour, 'Sub-Roman or Saxon', in L. Gilmour (ed. ), Pagans and Christians (Oxford, 2007), pp. 229–56 at pp. 247–9, 252; Steane, Archaeology of the Upper City, pp. 157, 210; Jones, 'St Paul in the Bail, Lincoln: Britain in Europe? ', pp. 332–3, 344; Jones, 'The Colonia era: archaeological account', p. 129. 8. Sample numbers 30, 29 and 26, see Green, Britons and Anglo-Saxons, pp. 65–6; Steane, Archaeology of the Upper City, especially pp. 160–1, 210; Gilmour, 'Sub-Roman or Saxon', pp. 248–50, 252–3. See also Jones, 'St Paul in the Bail, Lincoln', pp. 332, 344; Steane, ‘St Paul-in-the-Bail – a Dated Sequence?’, pp. 30–1. 9. On the results of the Bayesian modelling, see Green, Britons and Anglo-Saxons: Lincolnshire AD 400–650 (Lincoln, 2012), pp. 65–7, 83 (fn. 37), supported recently by J. Hines & A. Bayliss (eds. ), Anglo-Saxon Graves and Grave Goods of the 6th and 7th Centuries AD: A Chronological Framework, Society for Medieval Archaeology Monograph 33 (London, 2013), pp. 549, 550; as I note in Britons and Anglo-Saxons, my thanks are due here to Alex Bayliss, the Head of Scientific Dating at English Heritage, both for constructing a Bayesian model and for her analysis and advice with regard to the radiocarbon dates and chronology of this site. 10. 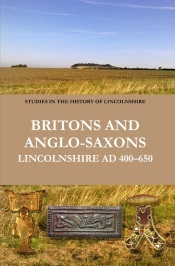 Green, Britons and Anglo-Saxons: Lincolnshire AD 400–650 (Lincoln, 2012), pp. 65–9, 82–3; J. Hines & A. Bayliss (eds. ), Anglo-Saxon Graves and Grave Goods of the 6th and 7th Centuries AD: A Chronological Framework, Society for Medieval Archaeology Monograph 33 (London, 2013), pp. 549, 550. Incidentally, it should be noted here that Gilmour's variant theory on St Paul-in-the-Bail (outlined in his 2007 paper 'Sub-Roman or Saxon'), which posits a mid-sixth-century de novo start for the church-stage of the site, is not discussed in the present post, as it both does not seem to have been widely adopted and—as was noted in Green, Britons and Anglo-Saxons, p. 82, and Green, 'British kingdom of Lindsey', p. 20, fn. 86—can be considered significantly less plausible than the scenario outlined here, lacking an obvious context and, moreover, seeming to be largely contradicted by the Bayesian modelling of the site. 11. Green, 'British kingdom of Lindsey', p. 21; Green, Britons and Anglo-Saxons, pp. 25, 67; and see further Jones, 'St Paul in the Bail, Lincoln: Britain in Europe? '; Jones, 'Colonia era: archaeological account', pp. 127–9, 137; A. C. Thomas, Christianity in Roman Britain to AD 500 (London, 1981), p. 197; K. Leahy, The Anglo-Saxon Kingdom of Lindsey (Stroud, 2007), p. 117. 12. For eccles names, see for example K. Cameron, 'Eccles in English place-names', in K. Cameron (ed. ), Place-Name Evidence for the Anglo-Saxon Invasion and Scandinavian Settlements (Nottingham, 1987), pp. 1–7; P. Sims-Williams, Religion and Literature in Western England, 600–800 (Cambridge, 1990), p. 80; C. Hough, 'Eccles in English and Scottish place-names', in E. Quinton (ed. ), The Church in English Place-Names (Nottingham, 2009), pp. 109–24. For St Augustine and the British St Sixtus, see N. P. Brooks, The Early History of the Church of Canterbury (London, 1984), p. 20; P. Schaff (ed. ), Nicene and Post-Nicene Fathers: Second Series, Volume XIII Gregory the Great, Ephraim Syrus, Aphrahat (Edinburgh, 1898), p. 77. On British bishops, see for example S. Bassett, 'Church and diocese in the West Midlands', in J. Blair and R. Sharpe (eds. ), Pastoral Care Before the Parish (London, 1992), pp. 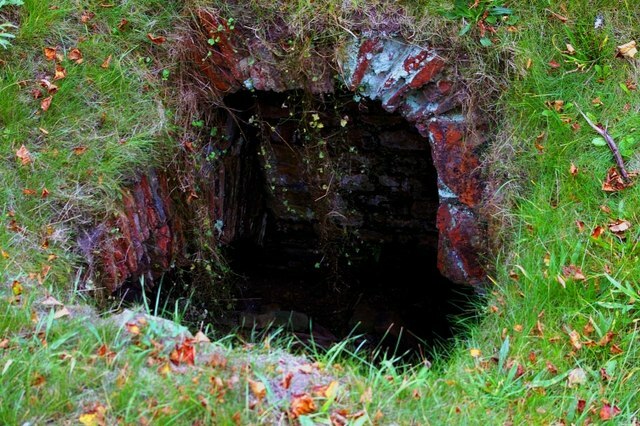 13–40; S. Bassett, 'Medieval ecclesiastical organisation in the vicinity of Wroxeter and its British antecedents', Journal of the British Archaeological Association, 145 (1992), 1–28; B. Yorke, 'Lindsey: the lost kingdom found? ', in A. Vince (ed. ), Pre-Viking Lindsey (Lincoln 1993), pp. 141–50 at p. 145; Jones, ‘Colonia era: archaeological account’, p. 137. See also S. Bangert, 'Menas ampullae: a case study of long-distance contacts', in A. Harris (ed. ), Incipient Globalization? Long-Distance Contacts in the Sixth Century (Oxford, 2007), pp. 27–33. 13. 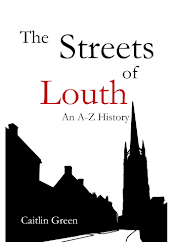 On late fourth- and fifth-century Lincoln, see, for example, K. Dobney et al, Of Butchers and Breeds: Report on vertebrate remains from various sites in the City of Lincoln (Lincoln, 1996), pp. 2–4, 57–61; K. Dobney et al, ‘Down, but not out: biological evidence for complex economic organization in Lincoln in the late 4th century’, Antiquity, 72 (1998), 417–24; Green, Britons and Anglo-Saxons, pp. 25–7. On the evidence for a degree of continuity in the pottery industry here into the fifth-century and possibly even slightly beyond, see Green, Britons and Anglo-Saxons, pp. 111–12, and Green, 'British kingdom of Lindsey', pp. 23–4, and the expanded discussion in Green, 'Romano-British pottery in the fifth- to sixth-century Lincoln region', blog post, 12 June 2016, online at http://www.caitlingreen.org/2016/06/romano-british-pottery-fifth-century-lincoln.html. 14. The case is fully developed in Green, 'The British kingdom of Lindsey', Cambrian Medieval Celtic Studies, 56 (2008), 1–43, and Green, Britons and Anglo-Saxons: Lincolnshire AD 400–650 (Lincoln, 2012).